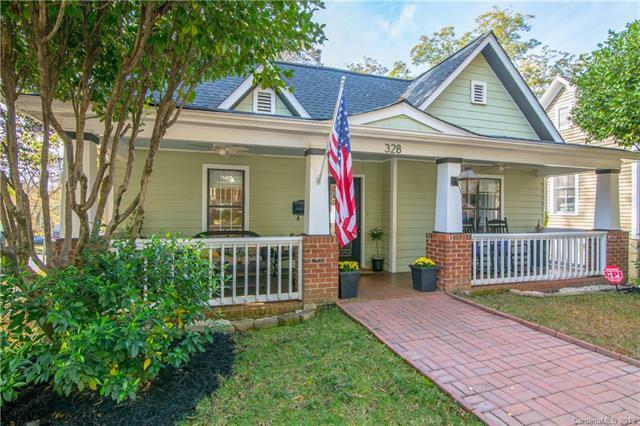 Gorgeous bungalow in sought-after Historic Dilworth situated on a corner lot! Great location; walk to the best of Dilworth and South End. Features open floor plan with modern updates throughout. With three bedrooms, two full baths plus a powder room, spacious laundry room, and separate secondary living space this home oozes charm. Spacious kitchen with lots of counter space, stainless steel appliances (all included), new upper cabinets in 2016, and a breakfast bar! Wonderful outdoor living with a rocking chair front porch and double story covered back deck featuring full living and dining areas plus salt water hot tub!. The spacious, level backyard is fully fenced and includes a patio and fire pit area, and garden. Automatic driveway gate leads to the over-sized finished 2-car detached garage built in 2016. The home also has an additional 515 sq ft in the unfinished basement area for potential expansion. New roof in 2016. A must see!